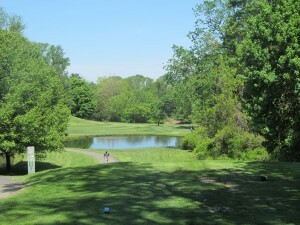 Many locals consider our first hole one of the most challenging opening holes in Bucks County. The opening hole features a tee shot that descends into a valley and back up the other side. Trees and out of bounds guard the right side from tee to green. The accepted aiming point for your second shot is the flagpole that sits just behind the middle of the green. The second shot will play 10-15 yards longer than your yardage will indicate. The green is a Redan-style green that actually slopes away from you and to the right. While no bunkers reside on this hole, four is an excellent score on this challenging opener. The green gives away the secret to Middletown: most of the greens break towards the Conrail freight line to the right of the first hole. 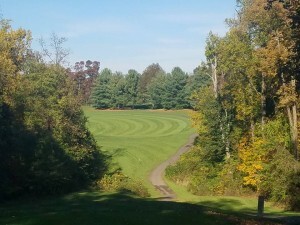 The second hole begins from an elevated tee to a fairway that looks like a ribbon from the tee and slopes left to right. Trees dot both sides of the fairway. A tee shot right of the fairway will be blocked out to the green by pines. 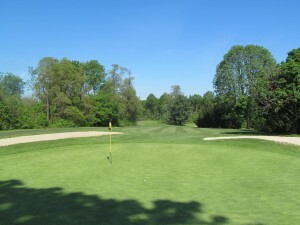 The two-tiered green sits at an angle to the fairway from front-left to back-right. The pin placement is also hard to notice from the fairway. Choosing the right club is vital. Miss the green right and your ball might bounce down the hill towards the out of bounds stakes. This hole was lengthened by Peter Fazio in 1997. Prior to the extension of this hole, the 3rd hole was a murderous 240-yard par three from the back tees with a diabolical green. While this hole is now a par four, the challenge still remains. The tee shot must carry onto an elevated fairway with trees on both sides as well as mounds on the left. The second shot into the green can be deceiving, as depth perception and a back bunker make distance control a must. The green is two-tiered and has some deceiving breaks and has a hidden bunker behind to catch a long shot. The club’s only par five is not as easy as one might think. The fairway bends slightly to the right along a ridge that forces your ball to the right once it lands. Trees await any slice on the right and pines are awaiting a hook on the left. More than likely, your second shot is going to be from a hanging lie with the ball below your feet. Long hitters do have a shot at reaching in two. Several swales defend the approach shot into the green and repel misplaced shots. The smallish green has some very deceiving breaks in it. A classic risk reward par four, this hole has created by George Fazio in the late 70’s and offers plenty of options. The longer the club you choose off the tee, the more risk that awaits. The safe play is a hybrid, fairway wood, or a long iron to the top of the hill in the fairway, leaving a 110-100 yard shot into a severely sloped green that falls off the right side. Shots onto the right side of the green have been know to spin off the green into the rough or a lateral hazard filled with underbrush. Positioning your ball underneath the hole here is vital. Another Stephen Kay/Peter Fazio renovation, the sixth hole was once a 90-yard downhill pitch that some players used to putt down the hill. Now the sixth is one of the prettiest holes on the course, offering a downhill tee shot over a pond to a big green guarded by bunkers on both sides and a large slope on the left. This hole plays into a prevailing wind, so club selection is vital. Par is a good score here on the first of four challenging par threes here at Middletown. The seventh hole is also a Stephen Kay/Peter Fazio renovation in part. 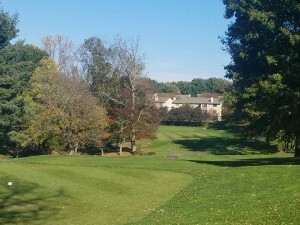 The green complex is an original George Fazio creation, but the teeing areas and the fairway in part were redesigned in 1997. 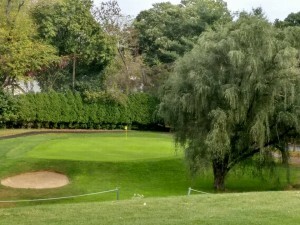 Longtime Middletown CC member Peter Fazio oversaw the design and shaped the teeing areas, including the back tee that is appropriately named “The Faz Tee” in memory of Fazio. 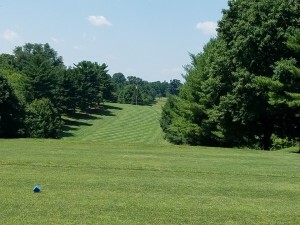 The tee shot might be the most demanding at Middletown, needing to avoid trees on both sides and a steep drop off into a valley on the left side. The dogleg left offers a crowned green that is protected by a lone bunker on the right. The green falls off on all sides like those designed by Donald Ross at Pinehurst #2, so you had better check the hole location when you play tee off on the nearby number five tee. Ironically, George Fazio designed this green while he was designing Pinehurst #6 with his nephew-world renowned golf course architect Tom Fazio. 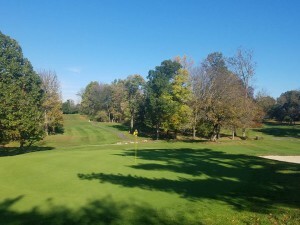 The second edition of the “Fearsome Four” Middletown par threes, number eight plays slightly uphill into a green that slopes hard from back to front and is guarded by two large bunkers that pinch in on both sides. Tall trees intimidate tee shots on the right side and any shot that missed anywhere but short makes for a very difficult up and down. Par is a very cherished score here. Go ahead-try and drive the green. Number nine presents the player with the opportunity to pick up a birdie. This dogleg right is guarded by many trees on the right side, several bunkers and out of bounds on the left. The right side of the green is guarded by a long, deep bunker that catches tee shots that possibly sneak through or over the trees. Some players will use a fairway wood or hybrid to the corner ofthe dogleg and then then attack the pin with a wedge. Certain areas of this green have a good deal of undulaton and judging the pin placement from the fairway can be difficult. 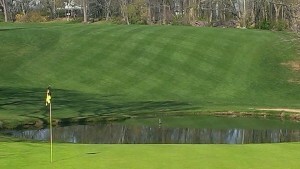 If there is a tougher par 3 in Bucks County, I’d be surprised. Pars are a rarity here. The tee shot must thread it’s way through trees on both sides and over a creek. The green is guarded by bunkers on both sides and an up and down from either one is no bargain. The putting surface sits on a plateau and is two-tiered with possibly the most severe undulation on the course. Birdies are few and far between with bogeys and double bogeys occuring frequently. If you donated a stroke or two back to par on number ten, here’s your chance to get one back. While this par 4 might short, it’s no pushover. Like number 10, the tee shot must thread it’s way through trees on both sides and carry a creek to reach the fairway. A lone bunker guards the right side of the green and out of bounds awaits on the hill behind the green. This green also presents a small target that is severely sloped from back to front. 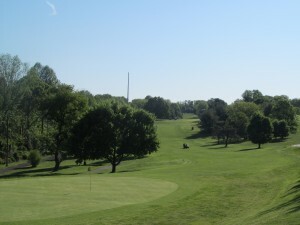 Middletown’s version of the “Valley of Sin” awaits on the front left of the green, as pitches and chips that are short or have too much spin are pulled down the slope and off the green. A putt hit from above the hole too firmly can find it’s way off the green entirely. Just as many bogeys are made here as birdies and eagles. Number twelve begins a five hole stretch that will flat-out test your nerve as well as your skill. A slight fade off the tee works best to avoid two bunkers left of the fairway as well as out of bounds that runs along the entire left side of the hole. A well-placed tee shot to the top of the hill will leave anything from a mid to short iron into a green that slopes both from back to front and left to right. Getting up and down from the left greenside bunker presents quite a challenge. Another pretty par four, thirteen presents the player with a demanding tee shot that must avoid out of bounds and trees all the way down the left side and several large trees on the right corner of the dogleg right. The player must deside whether or not to lay back on top of the hill on the fairway off the tee or bomb one down the hill onto the flat section of the fairway. Cimino’s pond and its famous carp await any chunked shot into the green. The green offers another challenge with a severe slope from back to front. No running it onto the green here. The green is perched onto a plateau with a large bunker protecting the right side. The tee shot will be a long to mid iron that must carry onto the middle of the green to avoid rolling off the false front of the green. Up and downs from down in front of the green are very difficult because you can only see the top of the flagstick. The final par three presents the player with as difficult a challenge as the other three one shotters. Level par on the four par threes presents the chance for a good score. Fifteen offers a different challenge that depends on the placement of the tee markers. The left tee presents a very difficult tee shot that must draw from right to left to avoid going straight through the fairway into trees. Players on this tee might consider trying to carry two mature trees on the left side of this dogleg left. The right side teeing ground straightens out the hole somewhat. The second shot can be anything from a fairway wood to a middle iron from a hanging lie with the ball above your feet. 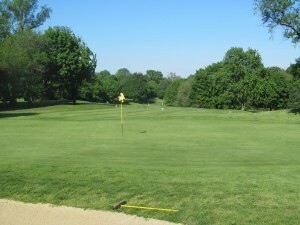 This shot plays slightly uphill to a green guarded by a bunker and trees on the right side and bushes on the left. The smallish green slopes back to front. Four is a great score here. Number sixteen is regarded as one-time club owner and golf course architect George Fazio’s favorite hole. 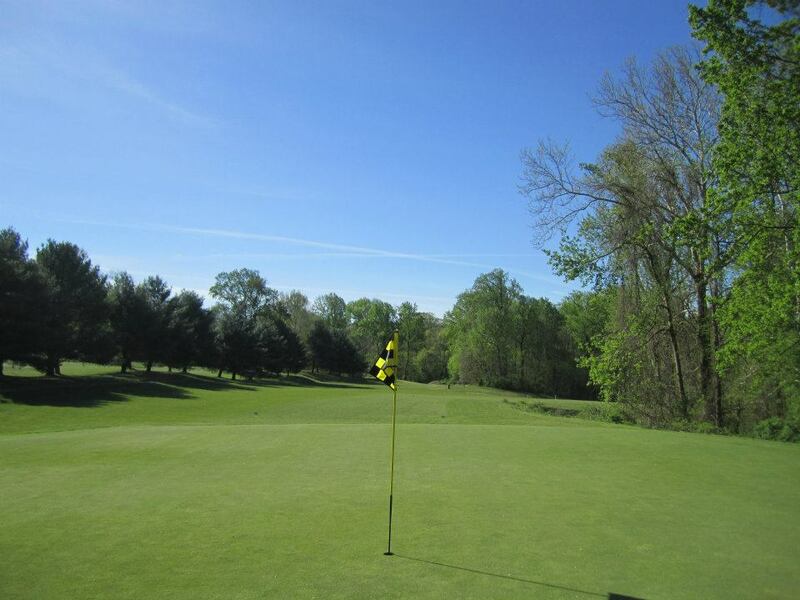 The tee shot must be long and down the left side at the three distant pine trees to open up an approach to the green. Short tee shots equal a layup to the top of the hill at the end of the fairway. The second shot offers the biggest challenge of a shot into a green. 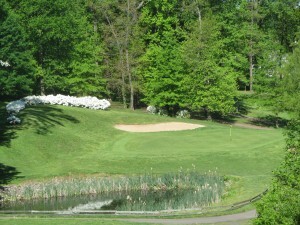 The green sits perched on top of a hill fronted by a large pond and a pot bunker. Out of bounds awaits on the right and long. Trees on the left will catch a pulled shot. The two-tiered green offers just one more challenge to this demanding par four. After battling the last five holes, seventeen might seem like a breather when one looks at the scorecard. Don’t be fooled. Yes, the green is very reachable and offers a tantalizing target. However, the quest for an eagle often causes topped shots into the pond in front of the tee, slices into a creek or trees on the right, or a hook into trees on the hillside on the left. Once the green is reached, the fun begins. 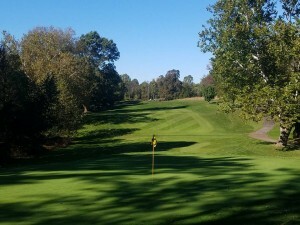 The green slopes from front to back and severely from left to right. Eagles and birdies can be made, but careless play can lead to bogeys or worse. 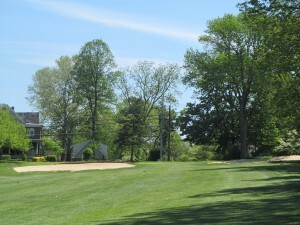 The finishing hole offers a panoramic view of the clubhouse and the historic homes of Langhone behind the green. The tee shot must avoid out of bounds on both sides and find a sloping fairway that falls away to the player’s left. The short second shot must fly two large bunkers that front the putting surface. Out of bounds greets the player a mere six paces off the back of the green. Once again, the player must keep the ball below the pin to have a chance at birdie. Like hole seventeen, just because the hole is short does not mean that it is not challenging. Like numbers eleven and seventeen, eighteen is a short par four but the green makes up for the lack of length by playing defense. After putting out,stop in Hacker’s Pub and Grill downstairs for a sandwich and a cold one to settle any wagers with your foursome.